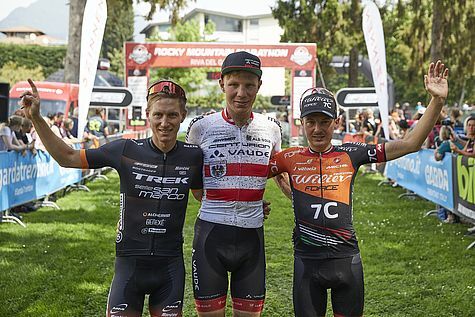 Daniel Geismayr (AUT) and Katazina Sosna (LIT) have claimed victory on the long distance of the 25th FSA BIKE Festival Garda Trentino's marathon event which took place today in perfect weather conditions in Riva del Garda and with some 2,000 registered participants. 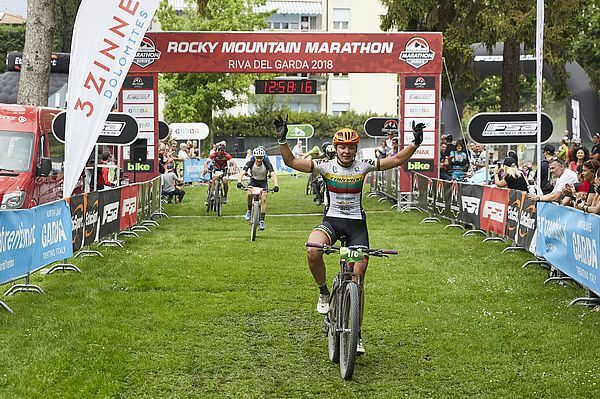 Ten years after his career's first MTB marathon which actually took place at Lake Garda, the Austrian Champion was finally able to sign in the list of Ronda Extrema winners of the Rocky Mountain BIKE Marathon. The 28-year-old from Dornbirn mastered the 93.93 kilometres and 3,838 metres of climbing in the stunning time of 4:17.07,6 hours . The 2017 World Championships Bronze medallist therefore relegated Italian athletes Samuele Porro (4:18.56,3) from Tram Trek Selle San Marco and Tony Longo (4:19.32,3) from Wilier Force 7C , who both had been setting the pace being right out in front for quite a long time, to the respective second and third rank. “It was extremely hard today, the tempo was tremendous. But I knew that I had good legs. I was keeping up the speed with the others and took it easy for a while although I also made sure that no one else could catch up again from behind,” explained Geismayr. However, the defending BIKE Transalp champion had to weather a moment of shock in the final downhill when he slid away due to a slow puncture and skinned his right underarm. “That was the only time when things got critical. I'm happy that I won today,” said the Centurion-Vaude racer who then was able to bring home a safe win. And was lauded by his competitors in the finish area. “It was a real summer day today. We normally have pretty cold conditions here in Riva at this time of the year – at least in the mountains. It took a while for me to get into the rhythm but Daniel [Geismayr] was unbelievable. Props to his performance,” stated Samuele Porro who had earned Silver at last week's European Championships outpacing Geismayr in Spilimbergo. The little town in the province of Pordenon, however, didn't become a place to be greatly remembered by Katazina Sosna. The Lithuanian athlete living in Italy wasn't able to finish the race for the European title and therefore had travelled to Riva del Garda seethed with anger. Und ihr Plan, sich für die Schmach der Europameisterschaft zu rehabilitieren, ging auf. Zwei Jahre nach ihrem ersten Sieg in Riva, stürmte die 27-Jahre alte Mountainbikerin auch bei ihrem zweiten Auftritt beim FSA BIKE Festival Garda Trentino zu Platz eins auf der Ronda Extrema. In 5:28.11,9 Stunden war Sosna dabei nur knapp zehn Sekunden langsamer als bei ihrem Triumph 2016. „Ich wollte es mir und allen beweisen, nachdem das Rennen in Spilimbergo so enttäuschend verlaufen ist. Ich wollte konstant auf höchstem Niveau fahren. Das ist mir gelungen, das freut mich“, so die Racerin des Torpado-Südtirol MTB Pro Teams. Platz zwei bei den Damen ging an Katrin Schwing (GER; 5:45.32,2) vom Katrin Schwing Trek Team, die bereits in den beiden Vorjahren als Dritte den Sprung aufs Podest geschafft hatte. Verena Huber (GER; 5:48.14,1) vom jb BRUNEX Felt Factory Team rundete das Podium auf Rang drei ab. Die kompletten Ergebnisse, auch aller weiteren Klassen, stehen hier zur Verfügung.